President Emmerson Mnangagwa gave his clearest hint that he would appoint another female as the new Zimbabwe Electoral Commission (Zec) chairperson following Rita Makarau’s surprise resignation, with three female judges being tipped for the high-pressure job, the Daily News can report. At pool of three stellar female candidates are being bandied around, cutting across the Supreme Court and High Court. In the Supreme Court, Justice Elizabeth Gwaunza, the most senior judge on the bench, is being tipped. Also tipped for the position are High Court judges Loice Matanda-Moyo and Priscilla Chigumba. But insiders said Chigumba is now front-runner to be Zec chairperson. Matanda-Moyo reportedly had high prospects but the fact that she is wife to Foreign Affairs and International Trade minister Sibusiso Moyo, a retired army general who actively took part in last year’s military intervention, has raised concerns that her appointment could be viewed as too blatant. Zimbabwe will hold elections in four to five months, according to Mnangagwa, who told the Financial Times that he was headhunting for a female to replace Makarau. Her departure came a few weeks after former president Robert Mugabe resigned and a few months before the country holds key general elections. week,” Mnangagwa told the Financial Times last week. “If the vice-chairperson is a man, the chairperson must be a woman, so I’m looking for a woman. “Secondly, the woman must have been a judge or a lawyer qualified to be a judge. I had names brought to me by the chief justice to say which judges — the head of the Law Society — which persons. Mnangagwa’s plan was scuttled by a series of engagements ahead of Davos World Economic Forum summit. But he is expected to name the new Zec chairperson as soon as he returns from the African Union heads of State summit in Addis Ababa next week. Mnangagwa is heading to Addis this weekend after receiving a warm welcome at the WEF gathering in Davos. Mnangagwa has already stated that foreign observer missions would be welcome to monitor the polls, which he asserts will be held in the next four or five months, a change from the previous regime that tended to allow mainly “sweetheart” monitors such as the Southern African Development Community (Sadc) to watch proceedings. multilateral institution to pledge support for the new dispensation in Harare. 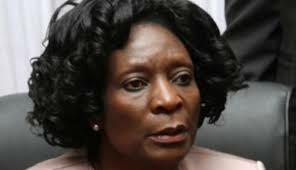 Justice minister Ziyambi Ziyambi said the appointment of a new Zec chairperson was the prerogative of the president. He was cautious on Chigumba’s prospects, saying no appointment had been confirmed. Chigumba joined Gollop and Blank law firm in 1994 soon after graduating with a law degree. She practiced as a lawyer for six years before joining PG Industries as assistant company secretary. She later formed her own law firm before joining the Justice and Legal Affairs ministry as a magistrate in 2004. Justice before she was sworn in as Justice of the High Court on December 20, 2011. Chigumba’s lack of attachment to the military might suit the powers-that-be if they are convinced she would be easier to control. She will give the facade that there has been a fair and impartial recruitment process but in reality they will still be in control. NKC African Economics analyst Gary van Staden said an acceptable poll is important for future engagements on business issues, but the real test is to see Zanu PF win a genuinely free and fair poll. The sudden and rapid developments in Zimbabwe late last year, which saw the military essentially remove Mugabe and subsequently elevate Mnangagwa to the top post, have ushered in a new opportunity for the country to achieve its economic potential as a powerhouse in the region.